An Exciting River Experience for Any Age or Age Group! Starting in May of each year and running through the end of October we are open for your enjoyment 24 hours a day, seven days a week! We have many packages available. They range from one person to groups of a hundred or more. 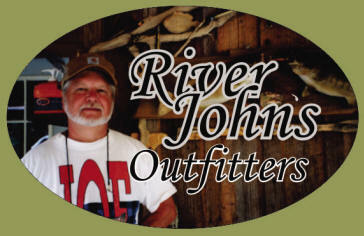 Please contact River John and give John the details on your group's planned outing. River John's River Island can has accommodated over 100 campers at times and more could be handled with ease. Certain areas are set aside for tents. Open areas are generally reserved for sports and games. There are no provisions for bathing or showers on the island so be warned ahead of time. Our campers wash in the river and have erected makeshift showers on their own. The outlay of the island does not allow for such facilities to be erected by state law. If you come to stay you need to be prepared for a primitive way of camping. Depending upon the size of your group, portable toilets are provided. The number of portable toilets on the island at any given time is based upon the number of campers enjoying the island. 2 Portapots on premises at all times. If your party is large and more are needed additional potties can be rented. There are designated areas set aside for camp fires. Please inquire as to their locations prior to setting up camp. If you wish to place tents near a campfire please pitch tents at least 20 feet back from the campfire areas.